I wish I could take credit for this idea, but Brian was making this refreshing summer salad long before I came into the picture. It regularly makes an appearance at family get-togethers and a slimmed-down version sometimes pops up as a weeknight dinner side. 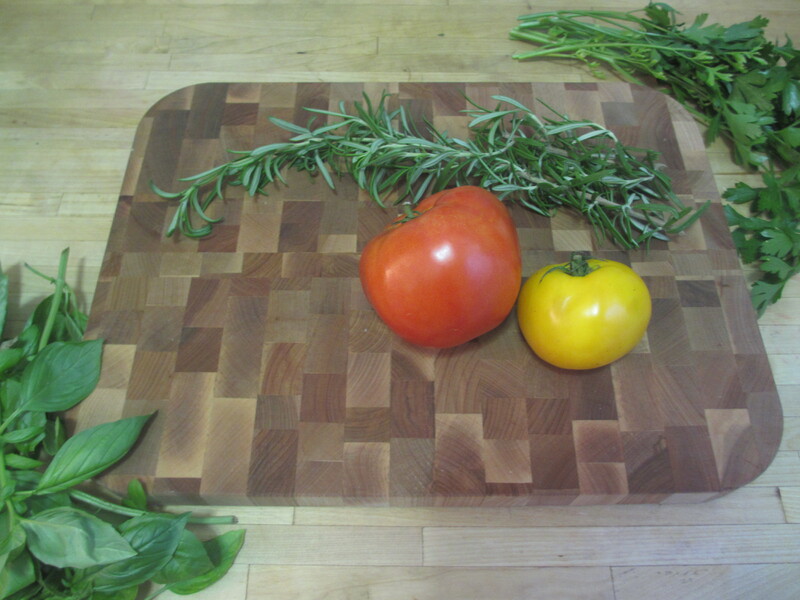 If you time it just right (usually sometime in July or August) you can get all of the ingredients while they’re at their peak for freshness and flavor. We recently whipped up a big batch and it was gone in less than 48 hours. Yes, it’s that good. Go ahead, make some and see for yourself. 1. Bring a large pot of water to a boil. Add the sugar snap peas and cook for 1 to 2 minutes or until crisp-tender. Remove from heat and plunge into an ice water bath to stop the cooking process, drain and set aside. 2. In a small bowl, combine the olive oil, white balsamic vinegar and sugar. Whisk until sugar is dissolved and set aside. 3. Cut the corn from the cobs and place in a large bowl. Add the sugar snap peas, grape tomatoes, basil and mozzarella. Top with dressing and toss to coat. Add salt and pepper to taste and mix well to combine. Chill in the fridge for at least 30 minutes before serving to allow flavors to develop. 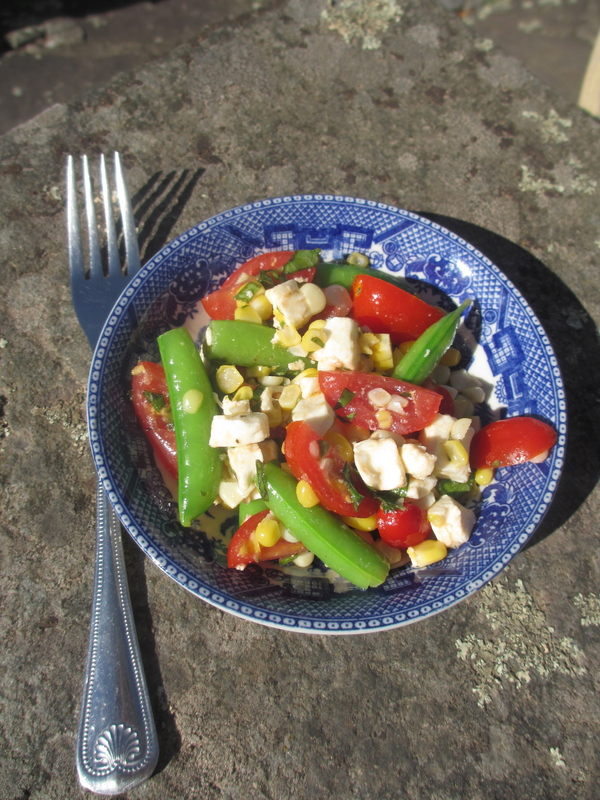 SWWU Tip 1: We’ve also prepared this salad with string beans instead of sugar snap peas. Both are equally delicious. Just choose whichever one looks the freshest. SWWU Tip 2: This salad also makes a lovely topping for mixed greens. This appetizer couldn’t be easier to put together (or a better value), especially when last-minute guests show up. Simply cut a baguette into thin pieces, top each with a thin coat of good-quality, room-temperature butter (this is where you should splurge a bit), then sprinkle with sea salt. 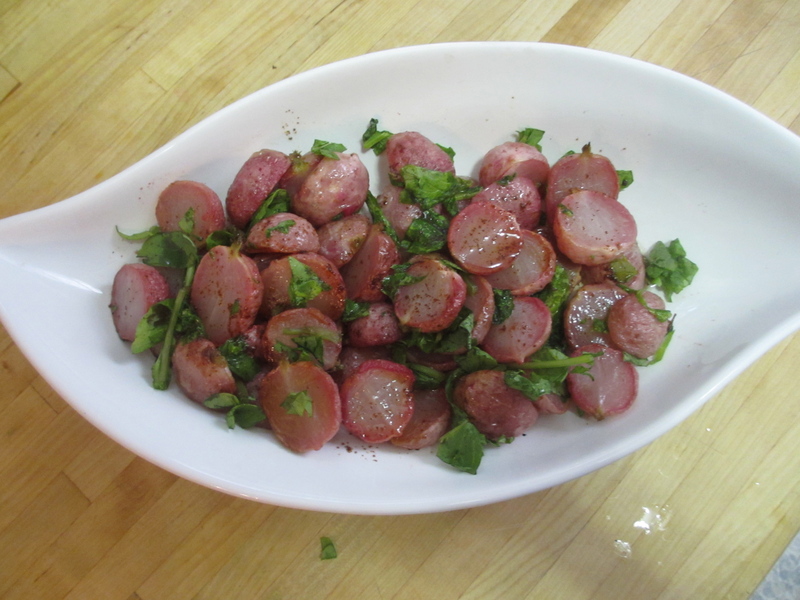 Top each with 1 to 3 pieces of radish (cut very thin) and serve. We served this slightly sweet side dish at our Easter dinner this year. It’s a quick one that you can easily make while multitasking on other projects. Just slice radishes down the middle and add olive oil, salt and pepper; toss to coat. Roast in a 375°F oven for 15 minutes, turn and cook 15 minutes more or until tender. Remove from the oven and drizzle with freshly squeezed lemon juice and toss with roughly chopped flat-leaf parsley. Taste and add additional salt and pepper as needed. Serve warm. We whipped up this last dish after a long day of farm projects. 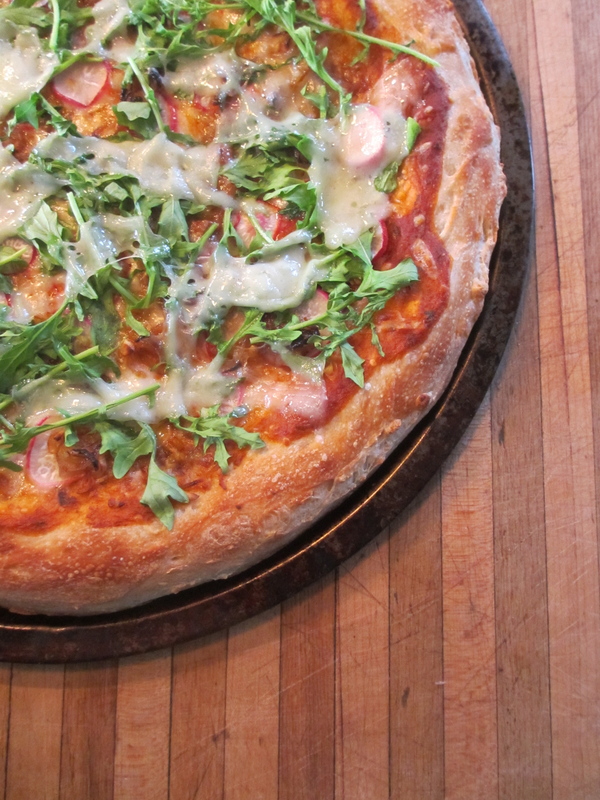 We got a little help from some time-saving store-bought dough, but feel free to make your own. Roll out prepared dough onto a pan and brush with olive oil. Cook in a 475°F oven for 6 minutes or until lightly browned (pop any bubbles that form with a fork). 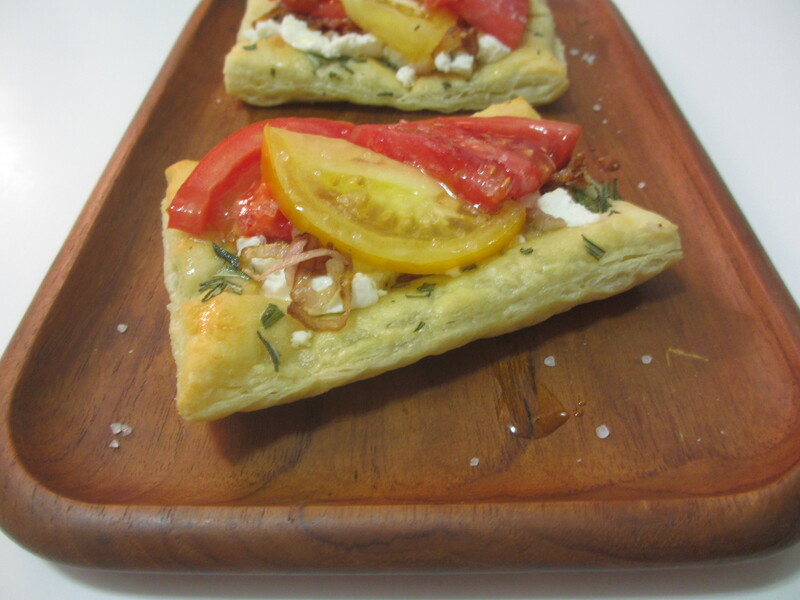 Remove from oven and top with marinara sauce, mozzarella cheese, thin radish slices and caramelized shallots. Cook for 4 to 5 minutes or until cheese is melted, then top with arugula and a few thin slices of Manchego cheese. Heat for 1 to 2 minutes more or until the arugula has wilted and the cheese has melted. Let sit for 3 to 5 minutes before slicing and serving. SWWU Tip 1: Flavor does matter with this veg. We’ve noticed that grocery-store finds tend to be a bit bitter and less sweet than the ones available at the farmers’ market. 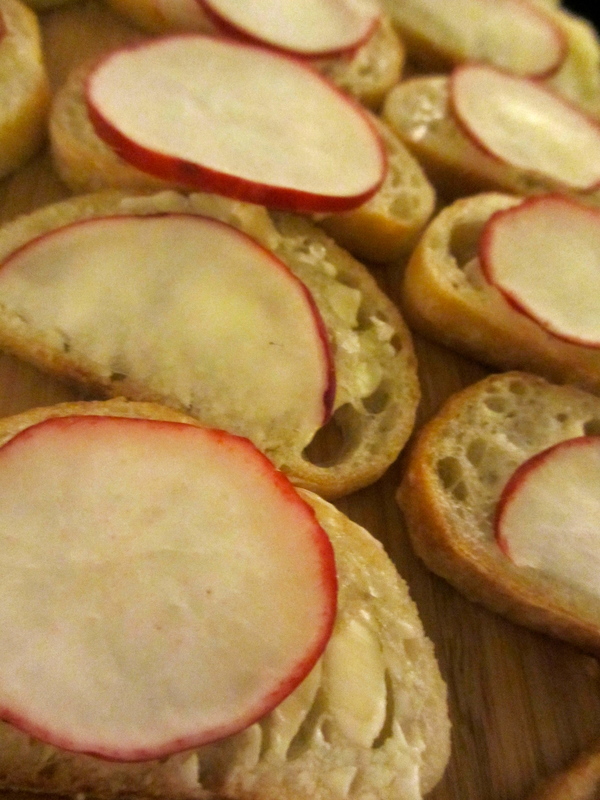 Buy radishes with the greens still on for the best flavor. And don’t toss them out! You can add a few to a salad or cook them down like you would spinach greens. SWWU Tip 2: You’re likely to see a few different colors and varieties of radishes at your farmers’ market. Try them all out and see which one suits your own tastes. We’re especially liking the mild flavor of the French breakfast variety these days. I have a confession: I’m not a fan of fancy homemade ketchup. My heart always sinks a little when I’m out to dinner and the server puts down a burger and fries and presents me with a ramekin of their chef’s own special creation. Perhaps it’s years of conditioning, but nothing beats the classic Heinz 57. Some things are just better left alone. But for everything that homemade ketchup is not, a fresh batch of DIY mustard certainly is a tasty treat. Brian and I recently made some to go along with a ham dish we were serving some friends. The spicy spread was a big hit and we have been dipping into it frequently. 1. 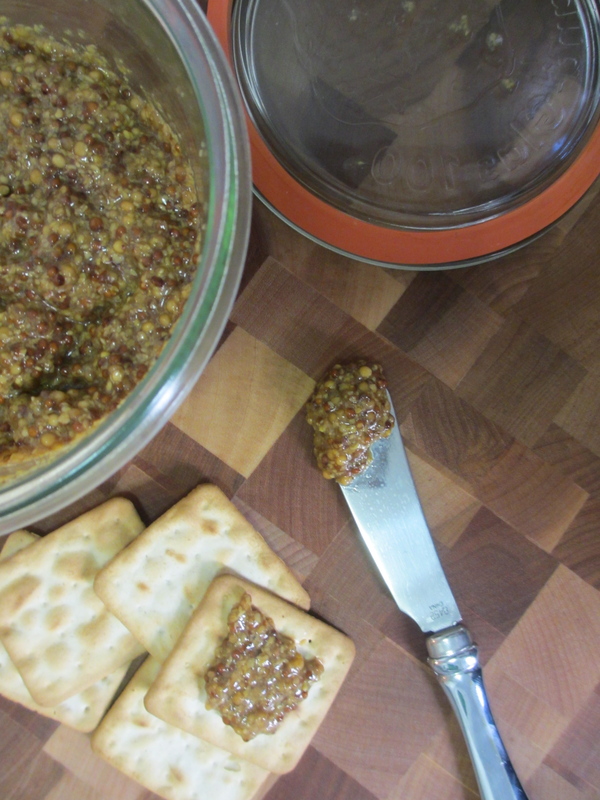 Combine the yellow and brown mustard seeds in a small glass bowl. Top with the vinegar and beer, then cover with plastic wrap. Let sit at room temperature for at least 8 hours. 2. Transfer soaked seeds and all their liquid to a food processor, add the brown sugar (the more sugar you add the sweeter it will be) and pulse to desired consistency. Transfer to a glass container with a lid and let it sit at room temperature for 24 hours, then transfer to the fridge for storage. The spread should last for several weeks. SWWU Tip 1: Unfortunately, this dish is not something you can test too much along the way. It takes some time for the flavors to ripen and develop, but it’s well worth the wait. SWWU Tip 2: Craving a sweeter mustard? Try adding 1/4 cup honey along with the brown sugar before you blend everything together. SWWU Tip 3: Play around with the amount of brown and yellow seeds. Yellow ones are a bit more mild, while the brown ones provide a pungent bite. Changing up the ratio of these ingredients will result in a completely different flavor profile. Mix it up and have fun! Brian and I both love to cook. The only thing that gets in our way is time. Our demanding jobs keep us at the office past the dinner hour on some nights, so quick meals that don’t make us sacrifice on taste and healthfulness are a must. The first person to arrive home gets the dish started and the other is usually able to lend a hand at least midway through. If not, dish duty it is! Last week we whipped up this tasty meal in no time (we’re talking 20 minutes or less) with ingredients we happened to have on hand. It’s definitely going to be a new staple in our repertoire. I bet you’ll enjoy it just as much! Bring a large pot of water to a boil, then cook the udon noodles according to package directions. Meanwhile, in a small bowl, whisk together the maple syrup, tahini, soy sauce and mayonnaise until well combined. Set aside. Add the sesame oil to a large pan and heat over medium. Add the broccoli and cook stirring occasionally for 3 to 5 minutes or until just tender. Mix in the snap peas and cook 1 to 2 minutes more until heated through. Stir in 2 tablespoons of the maple-tahini sauce and toss to coat. Add more sauce if desired. Strain the noodles and toss with 2 tablespoons of the maple-tahini sauce. Divide evenly between two plates and top with vegetable mixture. Additional sauce can be stored in an airtight container in the fridge for up to 3 days. SWWU Tip 1: The maple-tahini sauce can also be used to make a tasty chicken salad. Just make the sauce as stated above and combine with cooked shredded chicken. 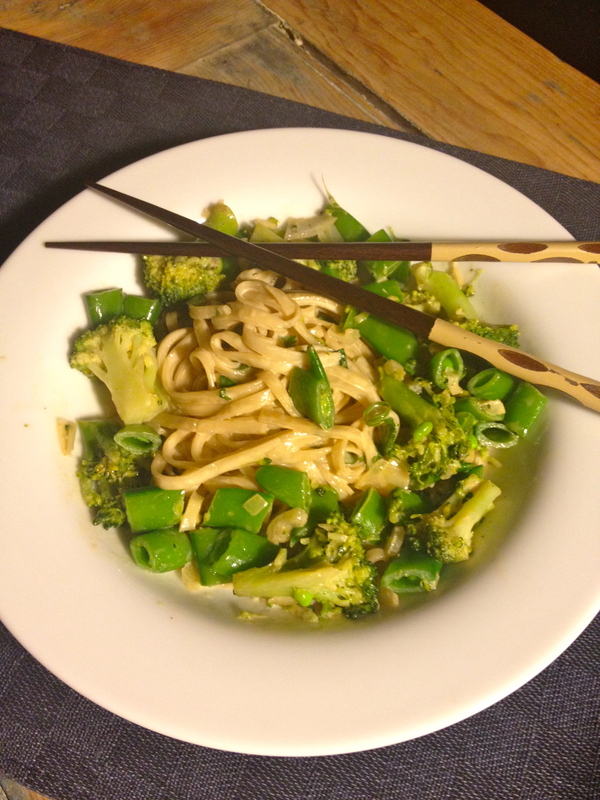 SWWU Tip 2: Make this dish gluten-free by swapping in gluten-free soy sauce and replacing the udon with soba noodles. Be sure to check the package to make sure you’re using 100 percent buckwheat noodles; some are made with a bit of wheat flour.